Here’s a quick weekend update, and I apologize in advance for whatever I forget. Also happening Saturday, The 21st Saloon presents California blues-rock guitarist Dennis Jones. Showtime has been pushed back to 7 p.m. for this show. Jones was part of Zac Harmon’s band when they won the 2004 International Blues Challenge. Keeping the Blues Alive Award winner for Journalism Dave Rubin says of Jones, “It’s risky to make predictions, but if anyone has a legitimate shot at filling the blues guitar hero void it is Dennis Jones. He has the head, heart and hands to do it.” See dennisjonescentral.com. Meanwhile, up in Benson, Kris Lager Band brings their thrift store funk roots music party to The Waiting Room Saturday, Sept. 19. Showtime is 9 p.m. and AZP opens. See krislagerband.com. The band receiving the most points will join first preliminary round winner The Rex Granite Band featuring Sarah Benck in the finals Sunday, Oct. 4. The finals will decide who will represent the Blues Society of Omaha in the 2016 International Blues Challenge in Memphis at the end of January 2016. See blues.org. Sunday Sept. 27: 4:00 Clean and Easy Band; 4:45 Swampboy Blues Band; 5:30 Cryin’ Heart and 6:15 Fry Daddy’s Live. For updates watch omahablues.com and Facebook.com/BluesSocietyOfOmaha. Sunday, Sept. 20, in Lincoln, Minnesota’s Charlie Parr plays Vega. Also performing are Jack Hotel and Mike Semrad, Jr. Showtime is 8 p.m. Parr is a veteran blues-folk guitarist whose influences range from Charley Patton, Lightnin’ Hopkins, Woody Guthrie and Leadbelly to Captain Beefheart. In one of the more unusual PR notes I’ve seen in a while, his press materials also note that “these days he tours alone, cooking his meals on his engine manifold and often sleeping in his car: while reassuring the reader “(he’s got a wife and kids back in Duluth).” Parr’s spring 2015 release, Stumpjumper (Red House Records), was named one of the best roots/folk albums of the summer by Rhapsody. His recent NPR Folk Alley session was just selected as an NPR Favorite Session. Vintage Guitar observes that Parr plays “new music from an older time – sometimes dark and desolate, sometimes raucous and danceable.” See charlieparr.com and Facebook.com/Charlie.Parr.Music. 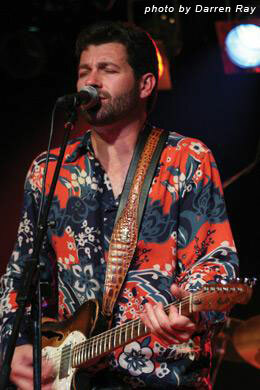 Everbody’s favorite charismatic Cajun bluesman, Tab Benoit, has a show at Lincoln’s Bourbon Theatre Monday, Sept. 21. Kris Lager Band opens the show at 7 p.m. See tabbenoit.com and bourbontheatre.com. The Alvin brothers’ latest disc, Lost Time (Yep Roc), hit stores Friday, Sept. 18. The disc is a rockin’ affair that pays tribute to more of Dave and Phil Alvin’s mentors and inspirations, including the great Big Joe Turner who was not only a hero to the young Alvins but became a close friend of the family. Other artists who get the Alvin brothers testifying, rockin’ testimonial include James Brown, Leadbelly, Willie Dixon, Blind Boy Fuller and Leroy Carr. Find out more at davealvin.net and yeproc.11spot.com/music/artists/dave-alvin/dave-alvin-phil-alvin-lost-time-pre-order-9-18.html.